I am making chicken cacciatore and rustic bread for Sunday dinner. I wanted a hot veg to go with these dishes. It has been a while since I made steamed artichokes. 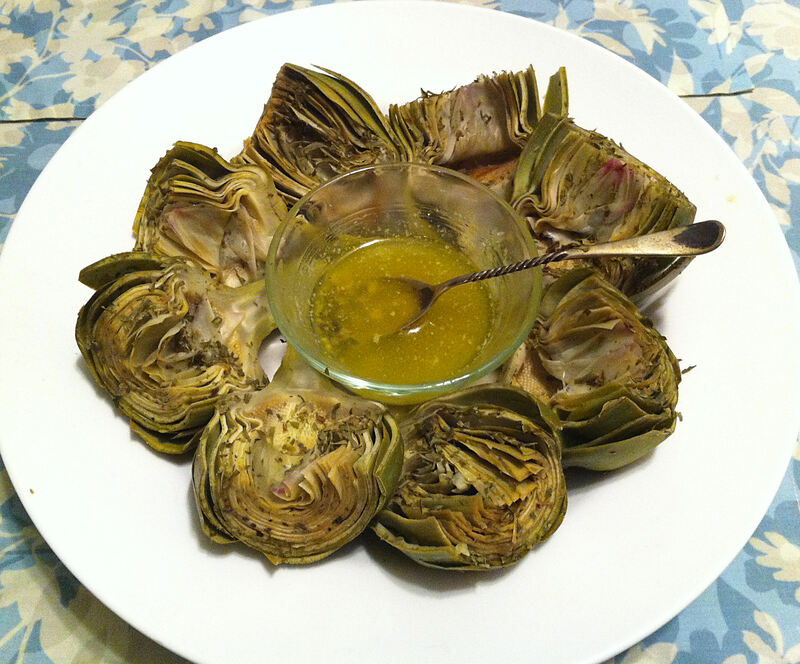 In the past, I would steam the artichokes in a little lemon juice and make a dipping sauce based on mayonnaise. Today I decided that I would dust the vegetables with dried tarragon as well as lemon. As a further change, I would also make a tarragon butter dipping sauce to go with it. 1. Trim and halve artichokes. Rub the cut surfaces with the lemon to prevent them from turning brown. 2. Lay the artichokes, cut side up in the steamer, and squeeze some more lemon juice over them. Tip: Put the lemon rinds in the water under the steamer basket. 3. Dust the vegetables with 2 teaspoons of dried tarragon. Tip: Crush the leaves between your fingers, so that the herbs coat most of the artichokes. 5. Put the butter, the rest of the tarragon, capers, garlic and salt in a small microwave safe bowl. 6. Micro wave until the butter has melted. 7. Mix the sauce ingredients well and serve on the side. Tip: If the sauce has coagulated before dinner, you may need to re-microwave briefly.